Hey, Ma! I'm in the iPhone! I’m mentioned in the iPhone, for something that likely isn't even in the iPhone any more. Back in the 1990s, I wrote an emulator library for the System V Unix poll(2) system call, for use on BSD Unix systems that, at the time, did not have poll. This library made it easier to port certain pieces of code from System V to BSD. Parts of Mac OS X are based on FreeBSD. When Mac OS X first came out, it lacked poll, so people found and began to use my library. IOS is based somewhat on Mac OS. 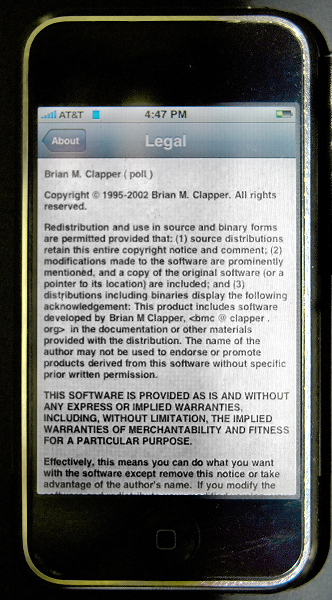 Presumably, the first versions of IOS also didn't have poll, leading people to use my library there, too—and resulting in the license, with my name, showing up in the Legal Notices. Mac OS now has poll, natively. (Type man poll in your favorite Mac terminal emulator.) Presumably, IOS does, too. 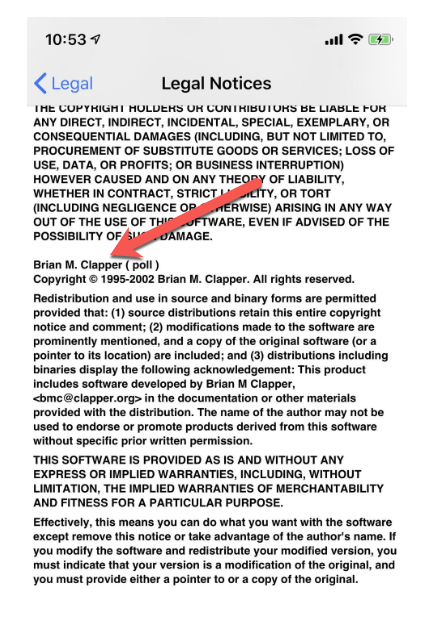 So it's highly unlikely my little piece of decades-old software is actually being used. I do have photographic evidence.